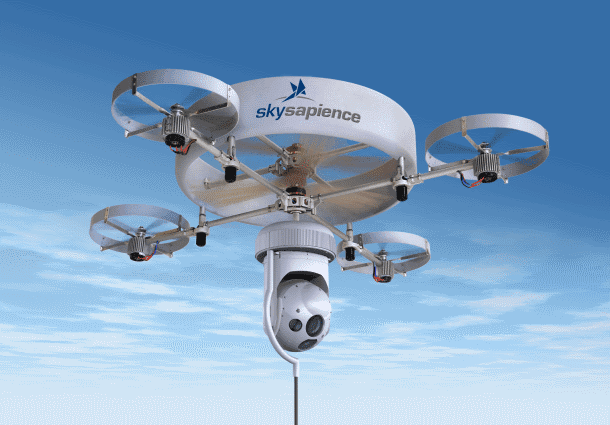 [Image: The Sky Sapience HoverMast, via sUAS News]. At the click of a button, the system autonomously deploys, rising to heights of up to 50 meters within 10-15 seconds. Secured by a cable, serving as a power supply and wideband data link, the highly stabilized HoverMast [... can also be mounted with sensing gear...] such as electro-optic sensors, laser designators, radar, and sophisticated COMINT and ELINT systems. While the HoverMast (also called "Sky Sapience") is currently being pitched to the only market that can afford it right now—that is, state-funded militaries, contractors, and police organizations—the availability of these and other semi-autonomous data gathering systems will continue to increase for the civilian realm (i.e. scientists, designers, artists, cartographers, and, as a lengthy new piece on Australia's ABC News explores, journalists). But what are the architectural possibilities for tethered sky masts and other instant cities made from semi-autonomous drone infrastructure? Film sets dramatically gridded with airborne towers, capturing every detail from previously impossible angles; roads appearing in the middle of nowhere, marked only by illuminated HoverMasts popping-up in lieu of street lights; cities in a blackout throwing ad hoc masts of light up into the urban sky; pop-off architectural ornament that rises, tentacular, from rooftops to catch better cell phone signals; and so on. For several years now, I've been (mentally) toying with a similar, if less architectural concept. Rather than using active propulsion in the form of a quadrotor platform, I've thought that a very small glider with an adjustable tether would make a nice addition to an automobile. Forward motion of the car would provide sufficient airflow to lift the glider, and the control surfaces could offer some flexibility in positioning. With one or more cameras, it could provide a way to, for example, "look around" a large truck ahead, or provide a downward view of your own vehicle. With a bit of processing (which could be in the car, since the tether allows things to be off-board the glider) it could even have limited autonomy - noting low bridges and similar obstacles and adjusting its flight profile accordingly. It might be nice to have a panoramic view from 50 or 100 feet above the ground as you drive through a scenic area. This type of multicopters was invented in Lithuania. Application number LT2012007. reminds me of this image from Tiananmen Square. that last comment is genius... nice to see you Anonymous .